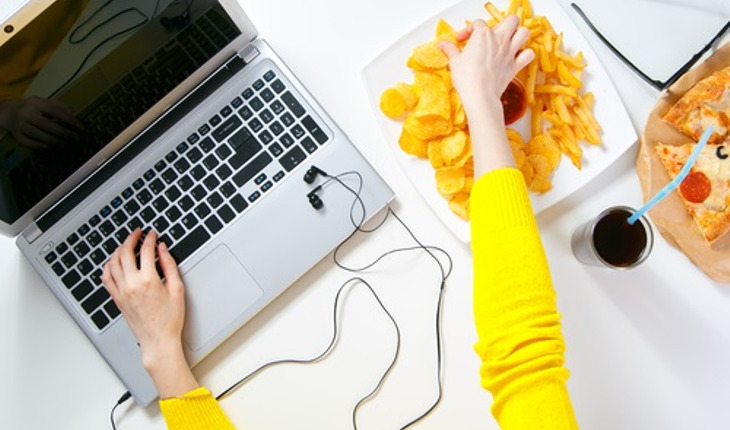 Have you ever skipped lunch when you’re just too busy to leave your desk? Or slipped sugar into your third cup of coffee to help you focus before a deadline? Does swiping a doughnut on free breakfast day sound familiar? “It’s all too easy to develop bad health habits when you work in a busy or chaotic office,” says Ivan Misner, Ph.D., cancer survivor and author of the new book, Healing Begins In The Kitchen. Called “The Father of Modern Networking” by CNN, Misner is the world’s leading expert on business networking, but when he was diagnosed with cancer in 2012, Ivan decided to make his office a healthier place for himself and his employees. With a few tweaks, like morning yoga, afternoon juicing, and Bring-Your-Own-Vegetable Day, Ivan made a difference in the health (and happiness) of his office. Stuffing snacks. It’s rare to see an office with healthy snacks for staff meetings. When you know you have a meeting coming up, get some baggies and pack a snack along with your lunch that day. Drinking too much coffee. Feel like only coffee gets you through the day? Me too. But get into the habit of replacing your second cup with herbal tea. They even make Kcups! Staying chained to your desk. Waiting for an important call, answering emails all day, always sitting, never standing? It’s common. Get a cool standing desk unit that allows you to work on your computer but stand – great for your back, heart and circulation. Skipping lunch. I’m too busy, got deadlines, I’ll just skip lunch and scarf a bag of chips when I can. Instead of going hungry, stash healthy non-perishable snacks in your desk drawer for easy access without leaving your desk. Stockpiling plastic water bottles. BPA’s [a chemical compound used in many plastic bottles] have been found to be very unhealthy. Instead of grabbing a disposable water bottle, get a Nalgene bottle or invest in a Brita filtration system for the office fridge.